Orientation: I-86 is the Southern Tier Expressway, which also carries the older NY 17 designation. It runs along the bottom, following the shore of Chautauqua Lake. At the far left, it crosses the narrows of the lake on the Chautauqua County Veterans Memorial Bridge. NY 430 is the surface road along the lake, entering at bottom right, then crossing I-86 before exiting the photo in the residential district of Oriental Park. Just west of the picture is the incorporated village of Bemus Point. The freeway entering at top and joining I-86 at the interchange is reference route 954J. It serves as a bypass of Bemus Point, as well as providing access to NY 430 for westbound traffic. Exit numbers: Exit 9 from I-86 is for NY 430, an eastbound-only exit marked as "NY 430 east/Bemus Point". Exit 10 is for reference route 954J; it is signed eastbound as "NY 430 west" and westbound as "NY 430/Bemus Point". The interchange: This is a typical "directional T" interchange with a three-layer crossing at its midpoint. What is unusual about it is that it is a very high-powered junction for a relatively rural area. The freeway bypass (SR 954J) seems to be a remnant of a never-built spur of the Southern Tier Expressway, probably intended to serve Mayville (the county seat) and Westfield. Some have speculated that the Southern Tier Expressway was originally planned to end at Westfield, instead of crossing the lake and heading into Pennsylvania as it does today, and that SR 954J is a vestige of this routing (this is supported by reference markers for route 17 on the spur). Whatever its original intent, it today serves the primary function of connecting I-86 traffic with NY 430 to the west without passing through the village of Bemus Point. Connections: Exit 9 is a half-diamond affording an eastbound exit and a westbound entrance only. Although it is signed from I-86 as "NY 430 east/Bemus Point", it actually connects to NY 430 in both directions; furthermore, it is NY 430 west (a left turn), not east, that leads from Exit 9 to Bemus Point. For westbound traffic, this question is moot, as traffic for Bemus Point, as well as that wishing to bypass it, must use Exit 10. The freeway spur carries signs for NY 430 west, but it does not actually meet this route until a diamond interchange just north of this photo, where County Route 44 also joins. It is at this interchange that westbound I-86 traffic is provided with access to Bemus Point, this time via NY 430 east. Also at this point, NY 430 west enters the freeway (while CR 44 continues straight through on the surface road) and continues its path westward, presently becoming a standard two-lane highway. 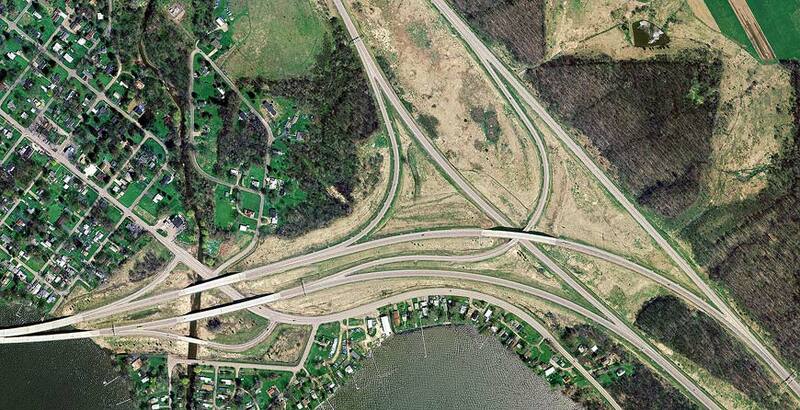 Finally, the diamond interchange serves as an eastbound entry to I-86 for traffic originating in Bemus Point. Until recently, this interchange was signed as Exit 9, continuing the numbering scheme for the westbound Southern Tier Expressway. The idea of being located at such an important junction of traffic routes is not a new one for Bemus Point. A ferry has long crossed Chautauqua Lake at this place, to Stow on the western shore. With the highway bridge now, the ferry is redundant, but it remains in operation during the summer months as a recreational diversion at least.